I get it. Consumer Reports is widely respected and well-known for really knowing how to do reviews and being very thorough. I’m just a mom who has spent the last nearly-decade testing over 100 natural sunscreens on her family in a mostly organized but sometimes haphazard way. I don’t have a testing lab. I don’t have a team of researchers. I don’t even have perfect documentation on everything I did. 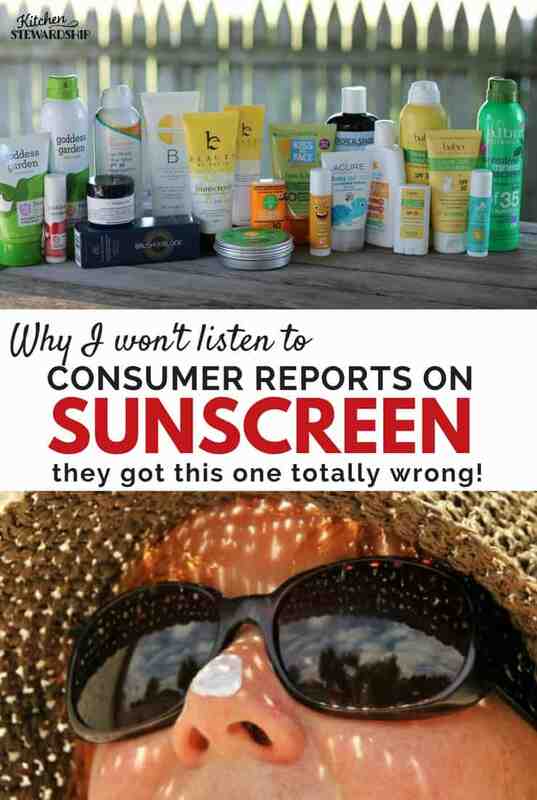 But I am still going to shout my disagreement with Consumer Reports’ last few years of sunscreen reviews from the rooftops until someone listens! In a summer 2017 series of articles, Consumer Reports specifically told people NOT to use mineral sunscreen because they’re not effective! Because “nearly half of the 1,000 sunscreen users surveyed said they look for a ‘natural’ product when shopping for sunscreen” in 2016, CR decided that they’d review more mineral options in 2017. Hooray for the people! So many are trying to make good decisions! For example, in a massive center aisle kiosk at our local big box store, there was ONE brand that even tried to be natural, and guess what? Of the 3 varieties offered, only ONE of those had mineral ingredients; the others were chemically-reacting actives anyway! See? Can you tell which of these you should actually buy? What’s a well-meaning mama to do to find the best, safe sunscreen for their babies? This is important news, because of course people want to know that the sunscreen they are spending money on actually works. However, the rest of their recommendations I could do without. CBS news, WebMD, the Today Show, Good Morning America… They all cover Consumer Reports’ recommendations. This is a great boost to certain brands, but every year CR downplays the importance of safety for humans and the environment. This year, as Hawaii works to ban oxybenzone and octinoxate, CR knew that it would be remiss in not mentioning those ingredients. So how did they handle it? They basically said the mineral ones just don’t work, there is no research showing that they are effective (except there is), but if you really care about that stuff, fine, do what’s right for your environment but the rest of us will just ravage our natural resources and not care one bit. I’m putting words in CR’s collective mouth a bit, but they continue to put real weight behind finding the right mineral sunscreens to test, in my opinion. Many in the comments on their 2018 sunscreen recommendations are asking for mineral sunscreens to have their own list, just so people can at least find out the best of that category. I’d be all for that! Avobenzone is the only chemical active ingredient that is rated for UVA protection, which means that every tube of sunscreen that doesn’t contain zinc oxide definitely has avobenzone in it. CR only allowed sunscreens in their top recommendations that tested well against UVA radiation, which means 100% of their chosen brands contain avobenzone. Guess what? Avobenzone causes terrible orange stains on clothing unless it’s washed off with soap before getting dressed! How is that going to work for people who are outside wearing collared shirts, etc? Save a buck on sunscreen, lose money buying new clothes all the time. One of the recommendations, Coppertone Sport Stick, even, shockingly, included vitamin A in the form of Retinyl Palmitate. This compound is well known to react negatively with the sun, and it has absolutely no place in any sun protection formula. Pregnant women are recommended to not use lotions with this substance, and yet, do you really think that every news outlet sharing these top five recommendations reminded pregnant women to be careful? I doubt it. That’s one reason why I never allow that ingredient in any of my top recommendations, or even second tier recommendations. I want to keep people safe, outside and inside. Five rated “Excellent” (the highest) for UVA protection. Only 2 tested at at least 85% of the SPF listed on their labels. Their top mineral sunscreen, although still only 47 points out of 100, was California Kids Supersensitive Lotion SPF 30+ (same in 2018, scoring a 55, but still not recommended). There’s plenty more that they didn’t highlight, like the fact that most of the “chemical” sunscreens also test far lower than the package SPF claims. Although back in 2010 I only had about 42 natural sunscreens to choose from that the EWG rated as very safe, there are now many hundreds. Consumer Reports must have used some system to decide which ones to test, but they don’t explain that in any of their articles or reports. They should have let me look at the ingredients first. For example, one of their “natural” screens tested in 2017 that does use good mineral active ingredients also has two PARABENS in the ingredients, stuff I don’t touch with a 10-foot pole! If a company making “natural” sunscreen (Fallene Cotz) doesn’t care enough about their customers to avoid parabens, I don’t trust them to do much else right either. The problem isn’t in the mineral sunscreen, it’s in the way those particular brands are choosing to market their wares. SPF 50 is too high for the actives to live up to. I’d rather have a great 30 SPF that won’t cause cancer and tests at 27 SPF or something that an attempt at SPF 50 that tests at 35 and gets horrible CR ratings! I would like to see them test some of my favorites. 2. CR Tested Water Resistance, NOT SPF! 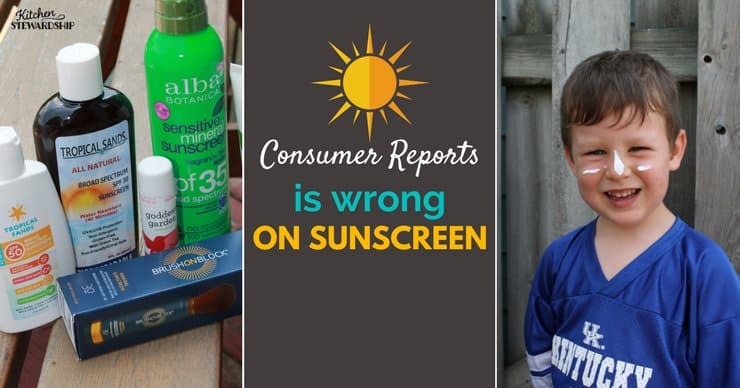 If you read how Consumer Reports tested the sunscreen samples, every sunscreen had to endure the maximum amount claimed in water (40 or 80 minutes) before being tested for UVB protection. 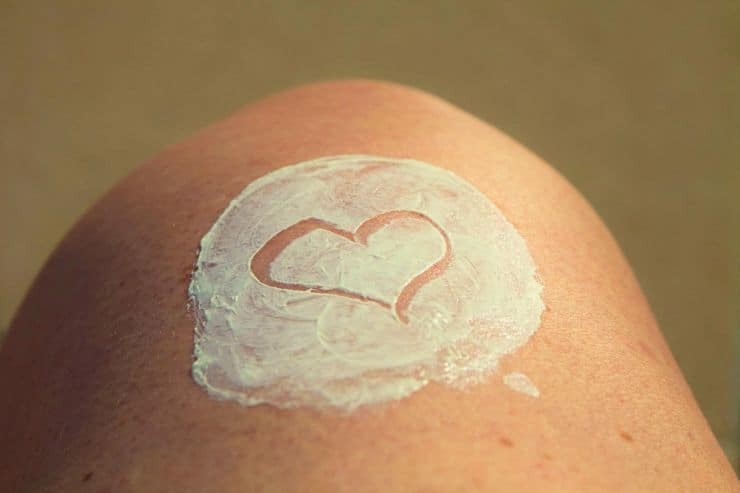 They never tested for SPF before putting their human subjects in water, which means that we have no way of knowing whether a cream might give awesome protection but just not live up to its water resistance claim perfectly. Granted, water resistance is super important much of the time, and I put a lot of weight on that too, BUT it would be nice to test overall protection without having that variable potentially interfere with the other data. UVA protection was tested without human skin or water involved. It takes a special machine, and it is NOT something we regular human beings can test at home. UVA rays are not the ones that cause sunburn, but the ones that cause cancer and skin aging (UVB rays cause cancer too though). All 5 of the tested sunscreens that use zinc oxide only rated Excellent on the UVA ratings for Consumer Reports (2017). As I would expect, every other sunscreen that tested well for UVA protection used avobenzone, which not only breaks down in the sunshine after 2 hours so you’re not protected at all anymore but stains clothing, as I mentioned above. This is far from consumer friendly. Are you burning with a lotion? It’s not working for you the way you’re applying it. Are you protected from burns? Then the UVB protection is sufficient for you, don’t you think? Plus, get this – the EWG reports that some of the chemical actives, including oxybenzone, may simply be “treating” redness from the sun as an anti-inflammatory, but not actually protecting the skin from other harmful effects of UVB rays! That means CR’s testing, looking visually at the amount of redness on a test subject’s skin, may be confounded by these ingredients masquerading as helpful. Good grief. And then some sort of point system ensues from that. Every single SPF 30 sunscreen tested, mineral or petrochemical actives, could not get an “Excellent” on UVB rating, the middle column. Even quite a handful that tested just as they should (i.e. “Excellent” in column 3, “Variation from SPF,”) only get a “Good” or “Very Good” in the middle UVB/SPF column. And an SPF 70 that lost points for NOT being accurately labeled for SPF (meaning it rated lower on the test) still got an “Excellent” on UVB/SPF rating (middle column). Reverse engineering CR’s metrics tells me that they weighted SPF 50 as more valuable than 30 by quite a bit. The FDA is proposing to cap SPFs at 50, and this doc at WebMD even says anything over SPF 45 is “silly” and recommends SPF 30 to patients. SPFs over 50 give so little additional protection, it really is silly. 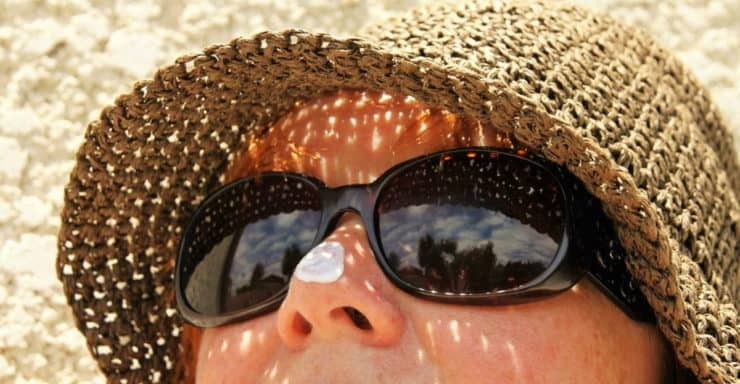 It’s also misleading to consumers, who generally feel that they can stay out longer in the sun with a higher SPF. The balance of UVA to UVB protection is skewed in higher SPFs, since UVA protection must rate at 33% of labeled UVB SPF. Thanks, Consumer Reports, for helping us all be “silly” with our sun safety. Every single one of Consumer Reports’ 15 “top recommendations” (except one) is a risk sandwich of avobenzone (which will ruin your clothes but was at least previously thought to be relatively safe; new research is coming out to the contrary!) and oxybenzone (the worst ingredient in sunscreens that is a massive hormone disruptor and environmentally persistent probably lowers thyroid hormone). Katie heaves a heavy, heavy sigh. Is that really worth getting an extra percent protection from the sun? “Skin cancer is the most common cancer in the U.S., and the benefits of sunscreens outweigh potential risks from their ingredients. That said, animal studies have raised some concerns about what’s inside these sunscreens. Notice that they recommend not to use on kids! They also explain in another section that you’re actually supposed to rub in any spray sunscreen for it to be as effective as the bottle claims. This pretty much negates all the reasons parents like sprays. Ditch them, people! Read more on spray sunscreens from Kitchen Stewardship. What Mineral Sunscreens Did Consumer Reports (sort of) Recommend? The mineral sunscreens were at a disadvantage from the start with double points given for UVB protection over UVA and the fact that a good mineral sunscreen rarely goes over 30 SPF. But two sunscreens that I’ve tested were the top two mineral options in 2017, at least! California Kids SPF 30 rates “fair” on UVA protection (the orange arrow) which makes sense because it only includes titanium dioxide, which is not as strong of a broad spectrum protector than zinc oxide. SPF/UVB protection was “very good” (the light green arrow) and “variation from SPF” was excellent, the highest rating, which meant that the product came pretty close to its SPF 30 claim, by percentage. Badger active unscented cream is one of my top recommended brands and only 1 point below California Kids. Its UVA protection is excellent (round of applause for zinc oxide! ), but UVB protection and variation from SPF are both fair. Hmph. They also tested Badger Sport Cream SPF 35 and found UVA protection to be excellent and UVB and variation from SPF as “poor.” I’m not surprised that if Badger is trying to raise the SPF that the variation percentage is going to be higher. I’m concerned that the UVB protection is rated so poorly BUT here’s the thing: What I’m taking from this lab testing is to celebrate the fact that zinc oxide in Badger (and actually every single zinc-only product tested) rates very high in UVA protection, which is something you and I absolutely cannot know from personal experience. Hip hip, hooray!! If you had a little sticker shock comparing Walmart’s cost per ounce to the mineral versions, keep in mind that there are frugal options when it comes to natural sunscreen. Do you trust Consumer Reports’ review? Would you buy their recommendations…or mine? Or neither? I think it’s such a shame that the mineral sunscreens were painted in such a bad light when the reviews weren’t done fairly. I do like that WebMD balanced the CR report out with an opposing viewpoint, and I’ll do my best to keep spreading the word about the dangers of conventional sunscreens! What’s your sun safety philosophy? Has your family ever gotten burned? The article that started my rant also appeared in the July 2017 issue of Consumer Reports magazine. I love badger sunscreen. When we go to the lake I lather it all over my kids and forget to put it on again for the rest of the day. My kids never burn. Their cousins, who use other sunscreens, apply theirs several times and still get burned. It’s great to know that it rates so high for UVA protection as well. Do you have an opinion on the mineral version of the Hang Ten sunscreen that you have pictured? That is also the only mineral sunscreen that our local store carries. I’ve never tried that on in particular, Liz, but at least the active ingredients are fine. 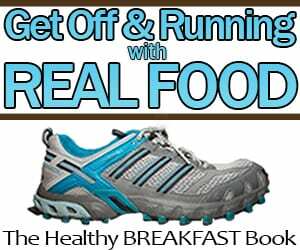 Look for only zinc oxide and you’re 95% better than other options! Parabens! It amazes me to see how many old & trusted brands, some of which are on the expensive side, still use them. It shows a certain disregard for the health of the consumer. After reading years & years ago now Dr. Mercola’s article on sunscreen ingredients & their dangers, I’ve chosen to use mineral sunscreen. Thanks for the great info (correction on their misinfo)… again. Will share. I switched to mineral sunscreen after reading your articles, Katie. I use Alba Botanica mineral sunscreen and never burn when using it. Without protection, I last about 20 minutes in the sun so I know it works. Too bad CR’s readers don’t get to hear about great products like that one!